"Enjoy Spring Break ... final prep before state testing ... get through testing ... finish out the year!" Hold on ... Let me push your thinking for a bit. 4th quarter is NOT time to wind down. 4th quarter is NOT time to start packing up. 4th quarter is NOT time to just "get through". Rather, EMBRACE 4th quarter! It's spring ... a time of renewal! A time for new growth. Honest and truly, 4th quarter is PRIME TIME! It is the perfect time to try out something you've been thinking about it. It's the perfect time to change up your routine and inject something wildly different. It's the perfect time to tackle a project. When will you know your students any better? When will you know the pacing of this class any better? When will you know exactly where in your day you can fit something in? When will you know how far you can push your students? When will you know the resources you have available to you any better? When will you be able to breathe knowing testing is over? When will you be able to see a more definite end date than the end of the year? What changes can I make in my own practice to move forward? Teaching is a profession that requires improvement, regeneration, and reflection. I don't see a good teacher becoming great unless these elements are present. I'll be honest, there was a point in my career that I wanted out. Teaching felt stale ... boring ... prescribed ... everything lived and died by the state tests. I wanted a change. And change arrived in the shape of a grant allowing us to go 1:1 with Chromebooks in grades 5-12. I won't lie - there were ups and downs. Nothing was perfect. Nothing is perfect. BUT ... I FINALLY felt that I had come into my own with these devices. They allowed every single one of my students to begin to craft their own educational adventures. I was able to curate, collect, share, differentiate, and empower each student in a manner that was meaningful to them. The first major "Aha!" ➤ Any student who needed to - or wanted to - could listen to their text. The days of forgetting (or losing work) was gone. Students could watch supporting videos to help them understand content. We could research using recent work. Students taught me how things worked. We explored. We could design. I built off what I already knew and had collected. I collaborated with other teachers. I was asked to present at a local gathering of fellow educators as well as in my own district. The fear nearly stopped me. But I'm so glad I didn't. When the opportunity arose, I accepted a split role of Tech Integration for the first half of the day, while remaining in the classroom in the afternoon. I share all this because sometimes changes happen TO you and sometimes changes happen because you MAKE them or INVITE them to happen. I have made 2 significant changes in my career ... one when I moved from 5th grade to 7th & 8th. And the other was moving into the Tech Integration role full time. With both changes, the past came right along with me. Fear accompanied both. Neither move was entirely smooth. Each year has helped me develop into who I am today. I absolutely LOVE helping teachers incorporate activities that provide content, thinking skills, and so much more. It's not about every student producing "something". Instead, I keep in mind the 4 C's → Critical thinking, Collaboration, Communication, and Creativity. It's no secret I 💕 Google. 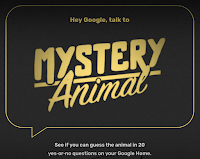 When I heard about "Mystery Animal" I had to check it out. Do you remember the game '20 Questions'? You have 20 yes-or-no questions in an attempt to figure out the secret person, place, or thing. 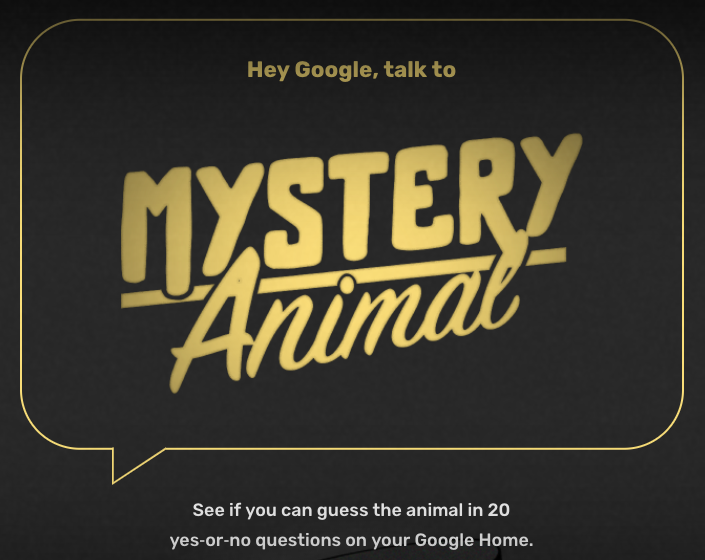 Mystery Animal with Google DOES THIS ... but with a secret animal! Hello, Science!!! I've now done this activity with several groups of students, and each time, the kids love it. They beg to do it again and again. (Here's a little secret ... only ONCE have we actually guessed the animal correctly! That's right ... we only WON once! And they wanted to keep doing it!) I always introduce it as a whole class activity so no one feels too frustrated. You can totally do this free-form, but I like a little more structure the first time through. We brainstormed as a class until every student had a question. I reminded students they had to speak CLEARLY and LOUD enough that the teachers computer could hear and then we turned on Mystery Animal and went to work! The students did GREAT! Every few questions, we paused to remind ourselves of previous answers (not a mammal, no feathers, no horn, lives in the water, etc). This helped us decide what our next question should be. LOTS of critical thinking!!! John & AJ distinguish Fail-URE as permanent while Fail-ING as a process is temporary. Describe how you see these terms play out in your classroom. My "classroom" is two elementary buildings (preK -4). I am a Tech Integration Specialist (TIS). I was a classroom teacher for 14 years and both fail-ure and fail-ing were a part of my teaching then AND now. Can't get around that. But I embrace BOTH as a means to be the person I am today. Actually ... FailURE, to me is an end. FailING is part of the process. I've come to realize that fail-ING only means a temporary stumble. It's how you pick yourself up and keep going! There have been so many times I've wanted to quit. Lessons have gone wrong, students have been difficult, testing has been the focus, budgets have been tight, admins have been difficult, and so on. The world we live in has so many amazing opportunities for our students to connect beyond the walls of our classrooms. Yet it can be overwhelming to DO this. Recently, I was able to sit in on two sessions where groups of 4th graders were able to converse with scientists from a different state! If you are willing, try out at least one of the activities - low-risk - below. I promise, you won't be disappointed! 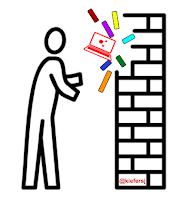 No, I'm NOT suggesting you throw your computer at a brick wall (maybe cinderblock is a more accurate description) ... but seriously. Our devices give us the opportunity to connect like never before! It can be scary, but it doesn't have to be. Any good teacher knows that hands-on & interactive learning tops lecture any day. Field trips are nice ... but a LOT of planning! Not to mention cost. And even more, the weather plays a role, lunchtime, the school day, chaperones, special circumstances, and the list goes on. If you have Internet connection and a little bit of technology, you and your students have unlimited possibilities just waiting! Take a field trip just about anywhere in the world! No permission slips, no weather worries, no buses needed! Search the list of over 700 available Expeditions - climb Mt. Everest ... explore the Galapagos Islands ... see what it's like to be paid to eat chocolate! ... college tours ... explore the volcanoes of Hawaii ... and on & on! 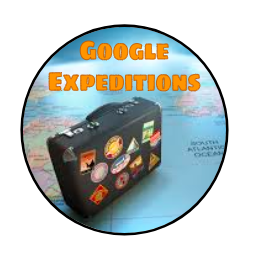 ✅ Google account (teacher only ... to be the "lead explorer"
“Student choice is the heartbeat of ownership and empowerment.” Respond to that statement and describe how you are honoring that statement. Now, more than even, we need to work with students on make choices. As with everything in education, we need to remember our "WHY" - it's the students! When I join a teacher in a lesson, I see students differently than the classroom teacher. I have that luxury. With that in mind, I see students struggling to actually MAKE choices. In the Week 1 podcast of the YouTube discussion, I was reminded that WE have conditioned the kids to rely on us to tell them what to do. WE need to help them learn how to make choices --- the only way to do that is to GIVE them choices. Probably the most powerful example I can offer is from working with 4th graders right before Christmas break. For fun, I showed them Eric Curts blog post 12 Days of Techmas. I gave them the opportunity to pick any of the 6 Googley Winter Activities. They literally sat there and stared at me. I prompted them, "Which one are you going to do?" One girl piped up & said, "The one you tell us to." I smiled and said, "No. YOU get to pick. Which one looks like fun? Scroll through ... read a little bit and decide on one you'd like to try. And guess what? If you don't like it, try a different one. There's NO right answer." Back at Christmas, Eric Curts shared his "12 Days of Techmas". One of the activities from Day 6 - "6 Googley Winter Activities" - was Pixel Art Ornaments. I shared these activities with several classes and they 💖'd it! (I still see students creating drawings with it!) If you've not checked these out, I highly suggest you do! They aren't just winter time activities ... they are use-any-time-you-want activities. Promise! Recently one of the 3rd grade teachers I work with, Laura Counts (@mrskidscounts) asked for my help with a project. She said her students loved the pixel activity so much, she wanted them to create book covers ... in pixel form! How cool!!! I set to work creating a template for her. Google Sheets is P E R F E C T for this! The first tab contains directions, the second tab contains a portrait style layout, and the third tab contains a landscape layout. Conditional formatting is used to create the "colored pixels". I turned off the gridlines for the entire sheet so that it looks blank. Then I added a black border around the outer edge of the "book cover" and light gray lines on the interior cells to show the cells. This gives the illusion of "pixels". 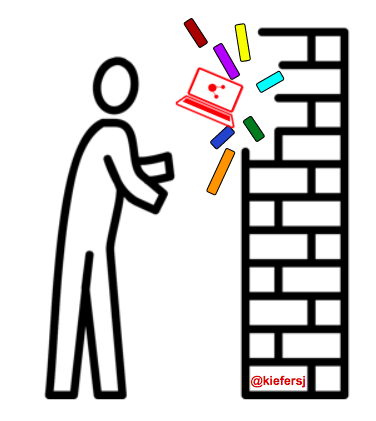 Once the student is satisfied with their pixelated book cover, the final step is a little "app smashing". 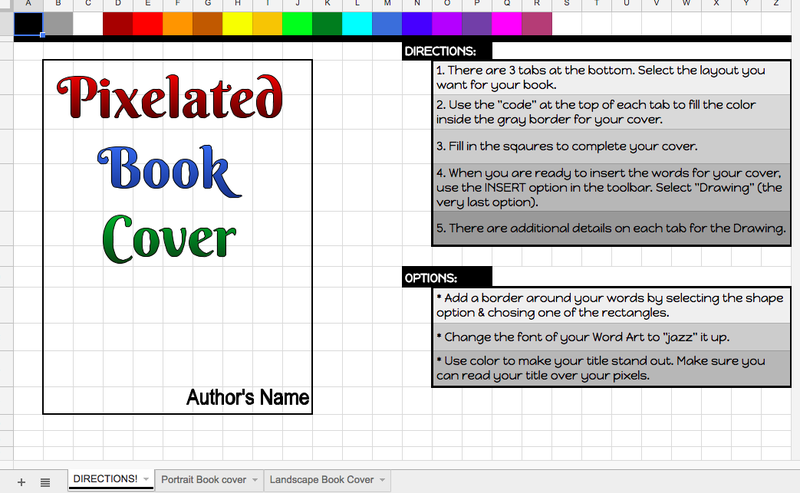 Inserting a Google Drawing ON TOP of their pixels allows them to include the title & author of the book. Students can "jazz up" the text to their liking. If necessary, more than one Google Drawing can be inserted to create the "perfect" cover 😉. Interested in trying this with your students? PLEASE DO! Here's a TEMPLATE. You are welcome to click on "Use Template" and 🌩BOOM🌩! You have your own copy! I'd love to see what your students create ... please share on Twitter and tag us @kiefersj & @mrskidscounts. Here are a few of the ones her students created ... I think you'll agree it was an amazing activity! 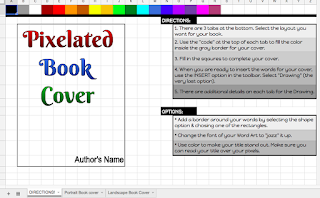 Using a Google Sheet for creating pixelated book covers (or pixelated drawings/images) is a great activity for event the "littlest" students! All it takes is a Sheet formatted to change when a letter is typed in. Week 1: AJ & John ask us to consider what students are “DOING” during our 400 daily available minutes. Why do we need to begin by considering the expenditure of time? Time is and always has been very precious and it's the one thing that we will never get more of, no matter what we do. As a teacher, we need to remember that our students are only with us for a set amount of time and then they move on so we HAVE TO MAKE IT COUNT. I taught 7th & 8th grade Social Studies and I only had each class for 42 minutes. Bells rang to start and stop class and I HAD to make those 42 minutes mean something to my students. I also was very aware that my students had 6, maybe 7 other classes, extra-curriculars, and home responsibilities. The "competition" with time inspired me ... it pushed me to become more efficient, but also trimmed the "fat". My little pie wedge of time was extremely precious to me. I wanted my students to know that I wanted the best for them, so I gave them the best of me. AJ & John ask us to invest a large part of our day “to inspire creativity and innovation.” Describe one thing you are doing to make this a daily priority. Integration Specialist in the same district I taught in for 14 years. I 💖 the people I work with. I 💖 the way I am challenged. I 💖 the opportunities I have every day at work.